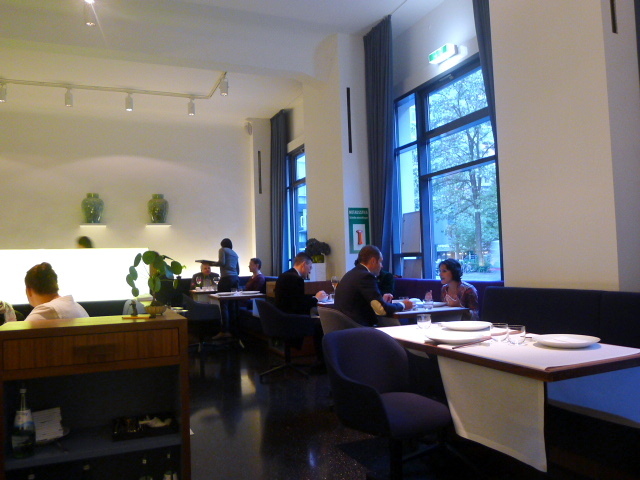 Restaurant Tim Raue, a one star Michelin restaurant in Berlin, is named after its executive chef, Tim Raue who has gained fame in Germany for his unusual approach to Asian cooking. His style is best explained on the restaurant’s website as ‘Asian cuisine characterised as a combination of Japanese product perfection, Thai aromas and Chinese cooking philosophy’. Raue came from rough and humble beginnings. His abusive upbringing and time spent in a gang as a youth is common knowledge in Germany – he’s also just brought out an autobiography. But despite this, he’s still managed to achieve success by winning a Michelin star and the Gault Millau Chef of the Year award in 2007. What is also interesting about the food at Restaurant Tim Raue is that it does not use any dairy products or complex carbohydrates. Raue’s philosophy is that you should be able to eat a full meal and feel full of energy afterwards. Therefore you will not see any potatoes or rice on the menu. Not serving rice is not an Oriental concept. Even the word for ‘meal’ in Cantonese literally translates as ‘eating rice’. But ok. Restaurant Tim Raue is a reincarnation of his previous restaurant, Ma, and only opened in September 2010. But the menu has remained the same and all but a few of his team from Ma have come over to the new restaurant which is located around the corner from Checkpoint Charlie. The move allows Raue to establish an ownership interest in Restaurant Tim Raue which he didn’t have in Ma. The decor is modern and sleek with high ceilings. This contemporary look is commonplace in London, but unusual for Germany where fine dining restaurants typically sport the more traditional classic look. I dined as a guest of the restaurant. We started with little sharing bowls filled with (from left to right) cashews with curry, pickled carrots, leaves dressed with sesame and Japanese cabbage flavoured with Japanese mustard. All were lovely, particularly the cashews which were well spiced and crunchy. 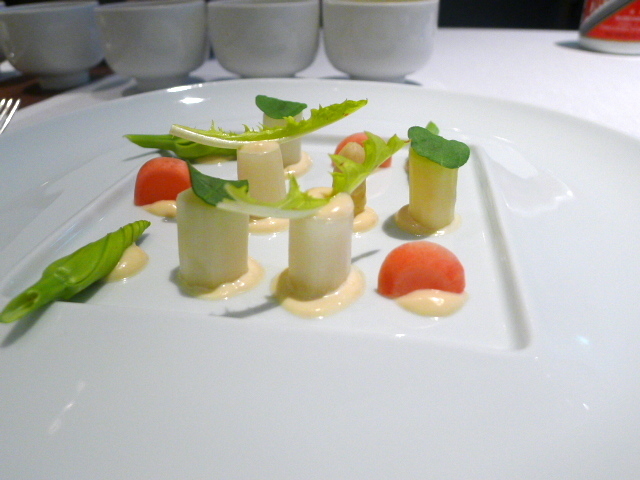 A pleasant dish of asparagus and sweet and sour radish on miso cream was topped with daylilies from Thailand. 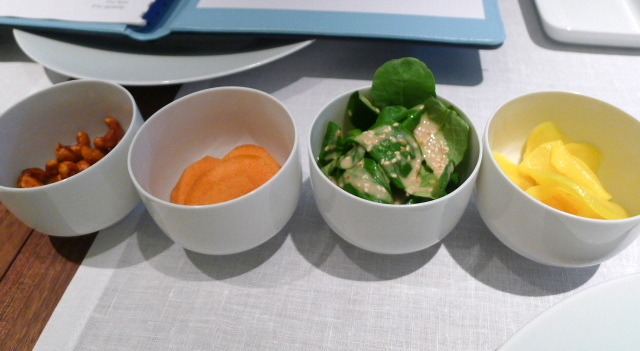 The vegetables had a nice crunch to them, and the miso cream was lovely and creamy. 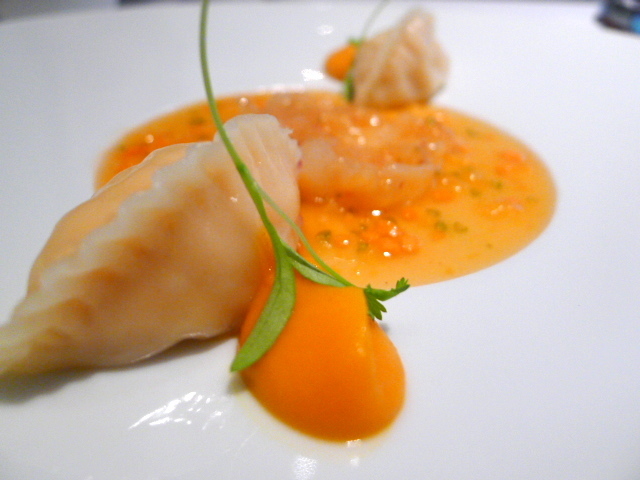 Lobster was served two ways, as dim sum and raw on a bed of carrot juice and ginger with a carrot cream. Lobster isn’t a very common ingredient to go into dim sum, and I believe it’s probably because there’s not quite enough flavour in lobster to carry it off. Here, the lobster in the dim sum had been minced and was pleasant but unspectacular. The pastry was not authentic Chinese dim sum pastry but it tasted fine. The lobster, served raw, was lovely and worked well with the freshness of the carrot and ginger. Steamed monkfish was beautifully cooked and flavoursome. 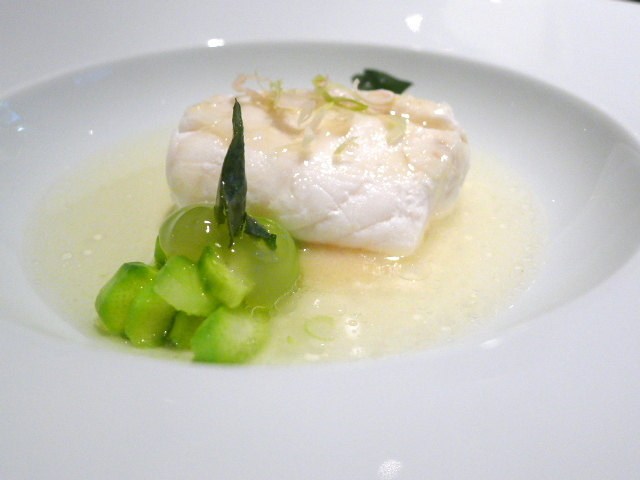 It was served on a bed of creamed onions in a lemon broth with lemongrass, lemon jelly and asparagus. The lemon overtones in the broth worked well with the fish. Next was abalone, a true Chinese favourite and is an ingredient that graces every major Chinese banquet. Its texture is firm, yet soft, and it has quite a delicate flavour. Here it was served with a sauce made with ginseng stock and matcha (Japanese green tea) powder, pickled ginseng and tarragon cream. The abalone on its own was beautiful, of a fantastic quality and nicely cooked. 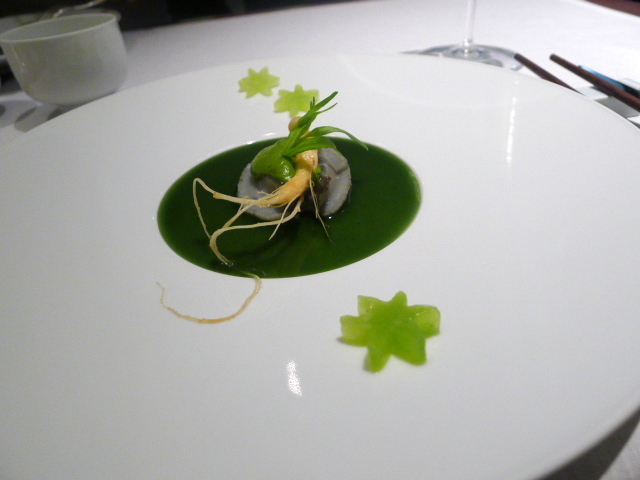 But the sauce was extremely strong and the ginseng was quite sharp, both of which had the effect of overpowering the sweet delicacy of the abalone. This dish did not work and both the sauce and the ginseng were inedible. This was no way to serve up abalone. Why ruin something so beautiful? To the meat course which was Raue’s signature dish, his interpretation of Peking duck. Raue does not use the traditional roasting oven that is typically used for cooking Peking duck, so it was impressive that he produced a duck which tasted this authentic, even if the skin wasn’t particularly crispy. The meat was plump and juicy and it was served with a clever 5 spice waffle which tasted like Chinese pancakes with hoi sin sauce and spring onions. 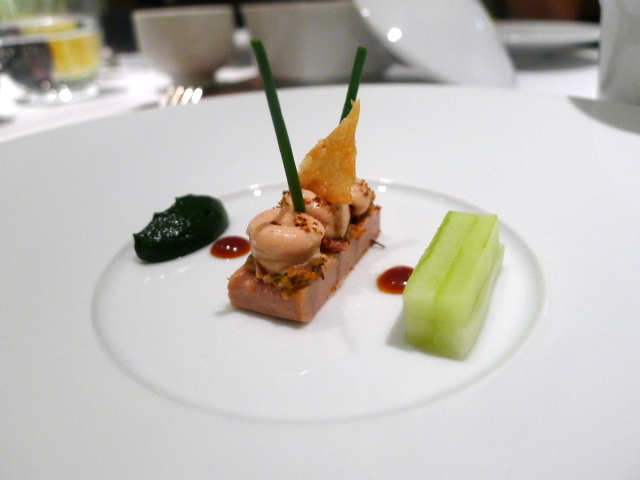 As an accompaniment, there was a small side dish of confit duck with foie gras, pickled cucumbers, leek and cucumber which was over seasoned. 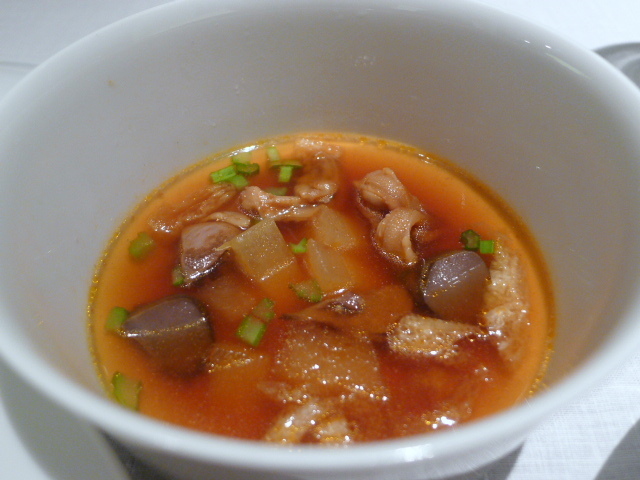 There was also a ‘duck’ soup of tongue, heart, stomach, a hint of chilli and melon. All the elements in the soup were well cooked and the soup had a nice flavour, but it was a little sweet and it because a little sickly after a while. 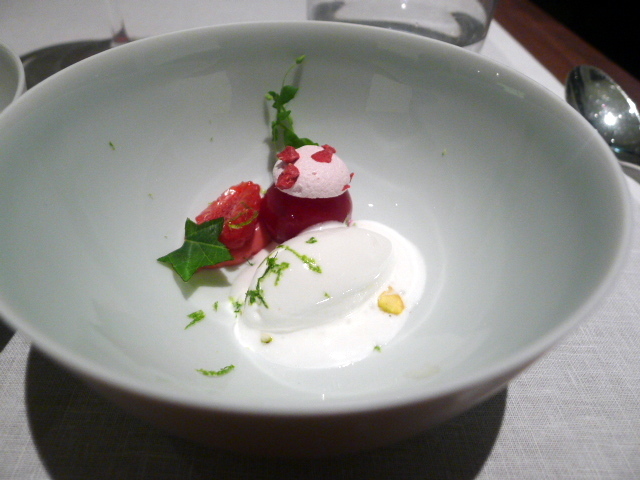 The dessert, a combination of bird’s nest, raspberries, lychee and rose jelly, shiso and wasabi was an oddity and unappetising. Bird’s nest, so called as they are built from bird saliva over about a 35 day period and used as breeding nests, is another prized Chinese delicacy and a personal favourite. They gain a gelatinous quality when immersed in liquid and is therefore why they are typically enjoyed in soups. In this dessert, the texture of the bird’s nest was wrong as it hadn’t been soaked properly and was a bit chewy and hard. The jelly was ok, and the bursts of wasabi were a little odd. There was also a little side dish of calpico (a Japanese non-carbonated milky soft drink) which was creamy and decadently tasty. This wasn’t so much an Asian meal, but a meal cooked using Asian products. But irrespective, Asian flavours, any flavours, have to gel, and not all the dishes hit the spot. Some of them lacked for balance, and even though the various ingredients were excellent quality ones, their use were a bit mish-mash at times. 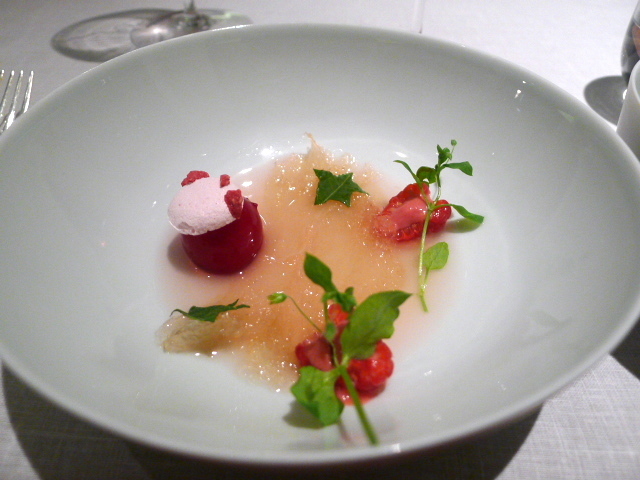 The abalone dish was a disaster and the bird’s nest dessert was pointless. There was a good demonstration of technique however, take the duck dish for example, and I suppose Restaurant Tim Raue was conceptually interesting, but considering the price, this isn’t necessarily my first choice for Asian cooking. 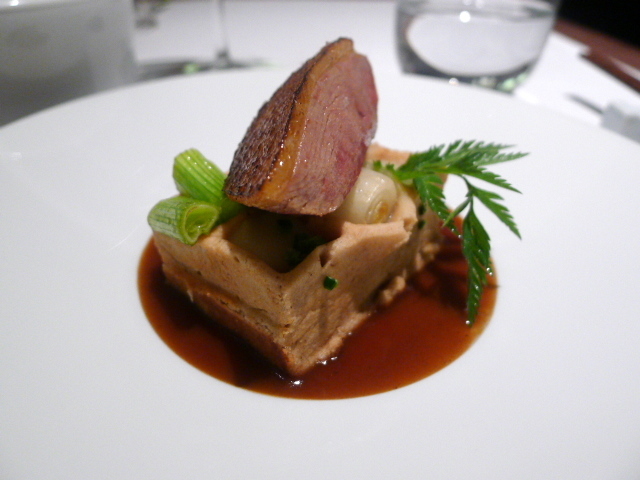 For my write-up Margaux, another one star Michelin restaurant in Berlin, click here. That looks like a pretty soulless room. And no crispy skin on the duck? Ayy yah. That’s an ‘AYY YAH’ on the no crispy skin on the duck. All my aunts and uncles would be chanting it. Great report, memories from a recent visit come back to my mind..